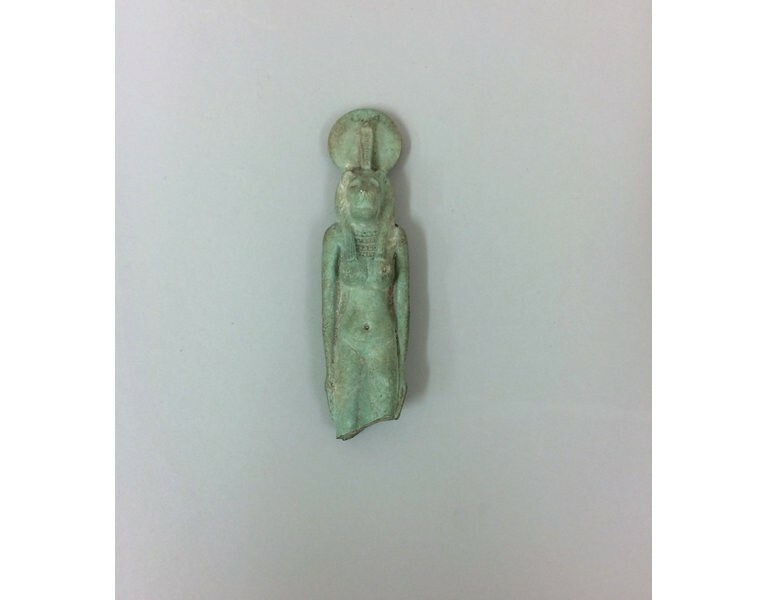 This amulet is part of a collection dedicated to Sekhmet, a goddess whom Denys seemed to have had a fondness for as she has more images in the collection than any other deity. 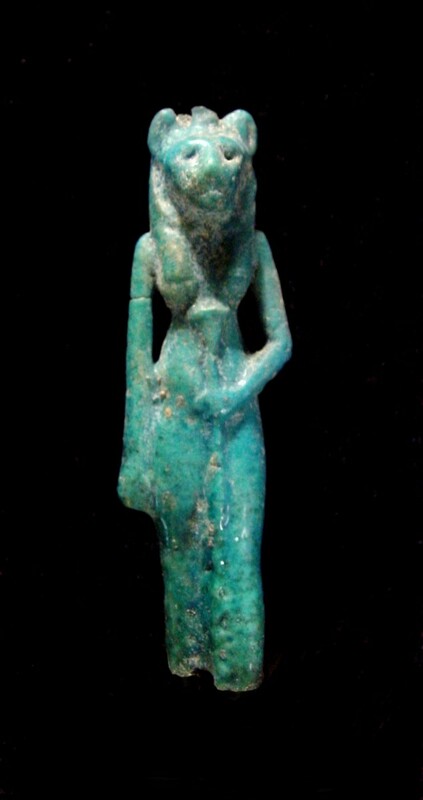 The medium sized amulet, in Egyptian faience, is depicted standing whilst holding a sceptre. 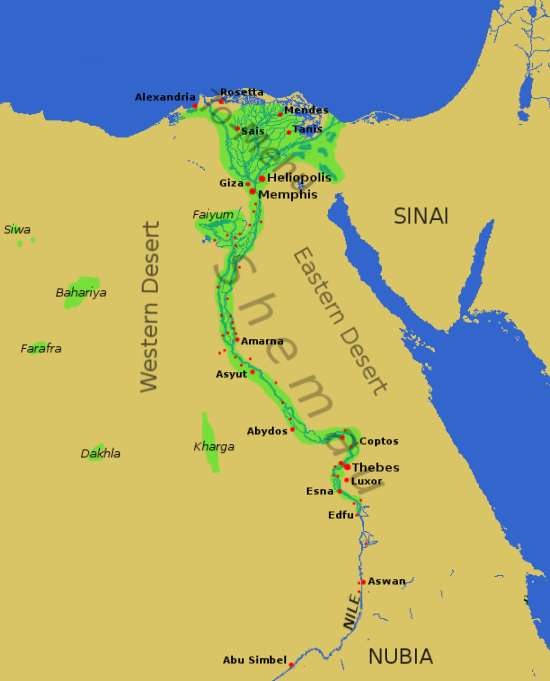 It was made during 664 – 332 BC, known as the Late Period in Egyptian history. As an amulet it falls under one of five categories set out by Petrie in his book “Amulets”, published in 1914 which Denys held in his library. Petrie discusses the different needs and functions of amulets during the Late Period and how they would have been used, classifying them as either an Amulet of Similar, which gives an ability to the wearer such as the ability of sight; an Amulet of Power, which gave power and authority to the wearer; an Amulet of Property, such as depositing an object in a tomb for the afterlife; an Amulet of Protection, which does what the name suggests and an Amulet of the Gods, which connected the wearer to the Gods. The amulet in the collection is labelled in the fifth category and would have therefore been linked to the Gods and helped connect those, who wear it, during worship. The amulet in our collection is covered in faience, a common substance made out of materials abundant in Egypt such as quartz, alkaline salts, lime and mineral-based colourants. This man-made substance allowed the Egyptians to make a variety of objects covered in a shiny, bright blue glaze which was a colour linked closely to fertility, life and the gleaming qualities of the sun meaning any objects created with faience were then considered magical and imbued with the powers of rebirth. Whilst the objects and faience were made out of common ingredients, they maintained an important status among the Egyptians and continued to appear in many forms over the long life-span of Ancient Egypt. During the Late Period, in which our amulet was created, a re-emergence of a centralised royal tradition appeared after many years of turbulent rule by different invaders, such as the Assyrians at the beginning of 664 BC, and different households such as the Saite Kings and Persian overlords. This new stability in the Late Period created a rich artistic atmosphere with the influence of the Old and New Kingdom models, after the Saite Kings admired them, whilst Dynasty 30 – the end of the Late Period – valued the late kings of Dynasty 26. These rulers, especially in Dynasty 28 to 30, were maintainers of tradition influencing the re-appearance of small objects – like our amulet – as well as cults and increase in the importance of Thebes. This left a lot of material remains that dominated the next stage of Ancient Egypt and these characteristics are viewed as the stereotypes of Ancient Egypt. Our Sekhmet amulet holds some of the key symbols associated with this goddess such as the lion head and the papyrus sceptre. These images held significance to the Egyptians who believed lions to hold divine courage and were therefore respected whilst the papyrus sceptre represented youth and growth due to the “flourishing of green plants” along the Nile. 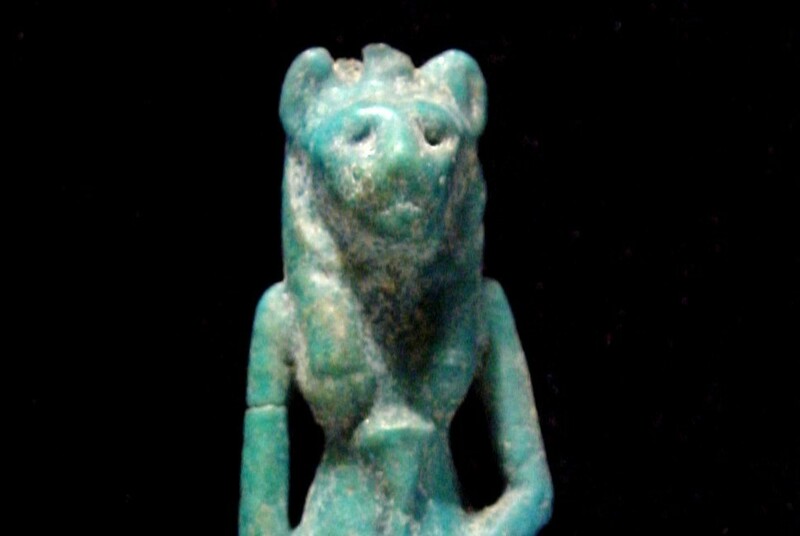 Sekhmet, however, is also pictured as a lion-headed woman adorned with a solar disk and a Uraeus. These symbols are absent in our amulet however appear in a variety of collections and other amulets. The solar disk adorning her head is linked to the sun as well as a homage to Ra, another Egyptian god. The addition of Uraeus, a serpent, is common as it means Goddess when used however it can also signify divine and royal authority as well as youth and being. 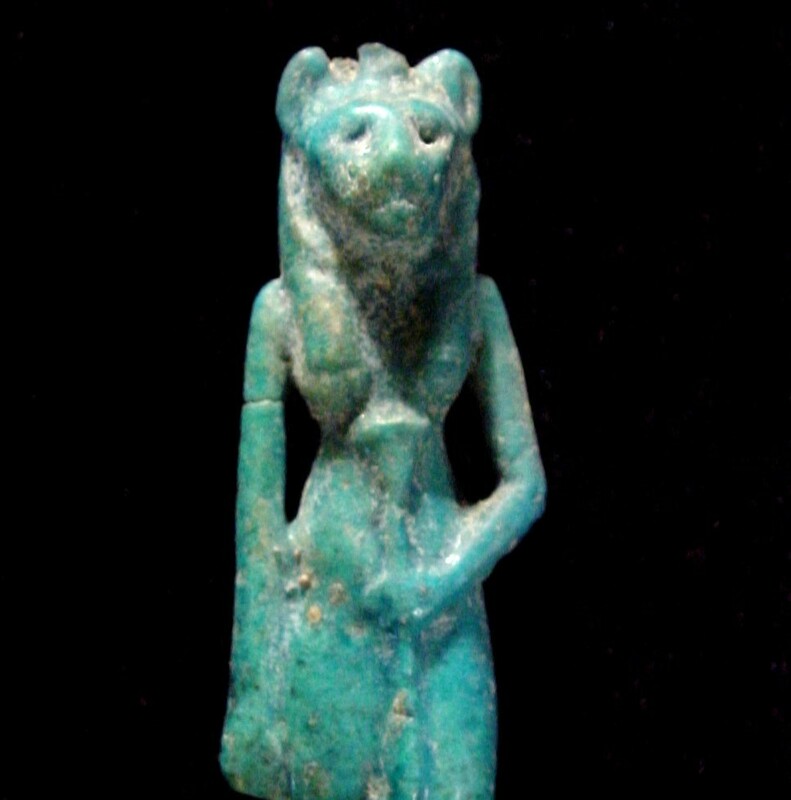 Sekhmet is linked highly with the sun, especially when adorned with the Solar Disk, which has caused some rulers in later dynasties to drape her figure in red. Her character possesses both qualities of the sun which has been recorded in many prayers and mentions of the fearsome goddess. Whilst Bastet, Sekhmet’s counterpart, favours the gentler aspects of the sun Sekhmet is often seen to personify its burning, fiery and destructive heat whilst representing a powerful warrior and protector. These traits have therefore, over time, linked her to the desert as the “lady of flame”. Her harmful nature does not end there, her fearsome warrior aspects makes her Goddess of War whilst her destructive force makes her Goddess of Disease. However, it is noted that she was not always a cruel god, if you appealed to her better nature Sekhmet would become the Goddess of Healing and prevent wars increasing a friendlier aspect to the lion-headed goddess. This charming addition to the collection can be found on display in the Egyptian room at Chiddingstone Castle along with the rest of the interesting Egyptian artefacts. This Object of the Month post was written by Victoria Simpson, our work experience student from Weald of Kent Grammar School. Victoria chose the amulet from our Ancient Egyptian display, and researched it using books from Denys Eyre Bower’s Library.